We're celebrates Dental Assistants Recognition Week. Thank you, Leslie, for 16 years. 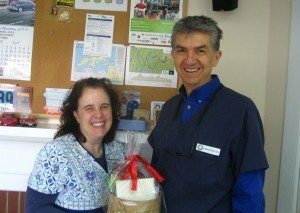 It’s Dental Assistants Recognition week (March 5-9), here at Seasons of Smiles. We want to give some recognition to Leslie for 16 years!!! It’s a pleasure working with Leslie, and we are looking forward to another 16 years. Leslie has been a Certified Dental Assistant since 1998 and licensed to take digital x-rays since 1996.